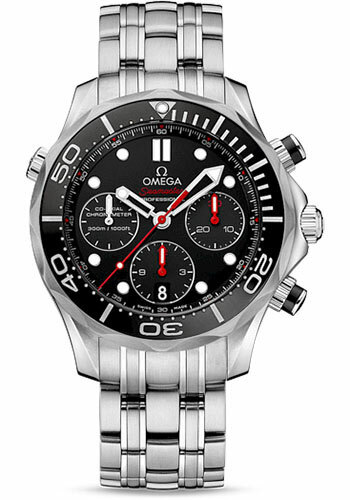 44 mm stainless steel case with helium escape valve, screw-in crown, unidirectional rotating bezel with black ceramic insert, domed scratch-resistant sapphire crystal with anti-reflective treatment on both sides, black dial, self-winding chronometer Omega 3330 movement with Co-Axial Escapement, chronograph, small seconds, and date, approximately 52 hours of power reserve, stainless steel bracelet. Water resistant to 300 m.
44 mm stainless steel case with helium escape valve, screw-in crown, unidirectional rotating bezel with black ceramic insert, domed scratch-resistant sapphire crystal with anti-reflective treatment on both sides, black dial with yellow accents, self-winding chronometer Omega 3330 movement with Co-Axial Escapement, chronograph, small seconds, and date, approximately 52 hours of power reserve, stainless steel bracelet. Water resistant to 300 m.
44 mm stainless steel case with helium escape valve, screw-in crown, unidirectional rotating bezel with blue ceramic insert, domed scratch-resistant sapphire crystal with anti-reflective treatment on both sides, blue dial, self-winding chronometer Omega 3330 movement with Co-Axial Escapement, chronograph, small seconds, and date, approximately 52 hours of power reserve, stainless steel bracelet. Water resistant to 300 m.
44 mm stainless steel case, sapphire back, screw-in crown, matt black ceramic bezel with unidirectional rotating, domed scratch-resistant sapphire crystal with anti-reflective treatment on both sides, matt black dial with red GMT hand that matches the red 24-hour scale on the dial which makes it possible to keep track of time in a second time zone, caliber 3603 self-winding movement with chronometer and 2nd time zone through 24 hour hand, 12 hour and 30 minute totalizers, start/stop push button, return-to-zero push button, approximately 52 hours of power reserve, stainless steel bracelet. Water resistant to 30 bar. 44 mm stainless steel case, sapphire back, screw-in crown, matt blue ceramic bezel with unidirectional rotating, domed scratch-resistant sapphire crystal with anti-reflective treatment on both sides, matt blue dial with yellow GMT hand that matches the yellow 24-hour scale on the dial which makes it possible to keep track of time in a second time zone, caliber 3603 self-winding movement with chronograph features with a small seconds sub-dial, approximately 52 hours of power reserve, stainless steel bracelet. Water resistant to 30 bar. 44 mm titanium case, engraved solid back, screw-in crown, matt black ceramic unidirectional rotating bezel with a polished diving scale whose indications have been created in relief using laser ablation, domed scratch-resistant sapphire crystal with anti-reflective treatment on both sides, sand-blasted grade 5 titanium grey dial with applied indexes coated with white Super-LumiNova that emits a blue light, calibre 3330 self-winding chronometer movement with chronograph function, column wheel mechanism, co-axial escapement for greater precision stability and durability, approximately 52 hours of power reserve, black rubber strap. Water resistant to 30 bar.